Henri Fantin-Latour (1836-1904) was born in Grenoble and first trained with his father, Jean-Théodore Fantin-Latour (1805-75), and then with Horace Lecocq de Boisbaudran at the Petite Ecole de Dessin in Paris from 1850 to 1856. In 1861 he worked in Gustave Courbet's studio for several months as a pupil. After a period of portraiture, Fantin-Latour concentrated on flowers paintings and still-lifes for which he is now best known. His flower pieces were especially popular with British collectors, and he exhibited at the Royal Academy in London from 1862 onwards, especially thanks to the patronage of James McNeill Whistler (1834-1903), whom he met in 1858. This painting is a fine example of Fantin-Latour's paintings of flower, a category in which he progressively specialised executing up to 500 floral compositions. 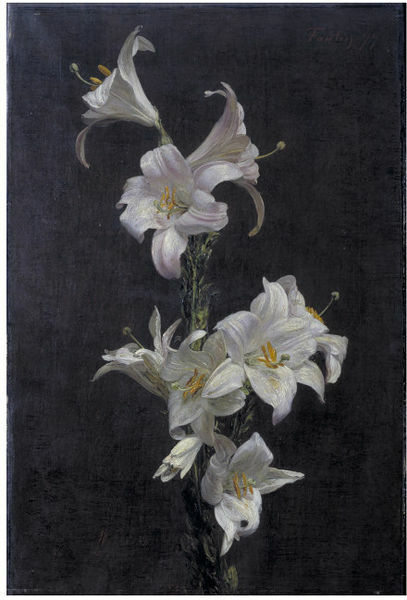 This painting shows a stem of white lilies whose pure white contrasts against the plain dark background. This effect of light and colour are characteristic of the new naturalism developed in French art in the second half of the 19th century, which anticipate the Impressionists' new experimentations. 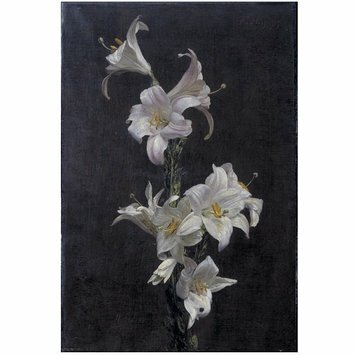 Oil on canvas depicting white lilies. Bought in 1882 from Mrs Ruth Edwards as a 'school example'. Historical significance: This painting was probably painted in Paris in Fantin-Latour's studio. It shows a stem of white lilies silhouetted against a a dark plain background, the motif being cut off on the bottom edge. It is one of the three paintings the South Kensington School of Design, now Victoria and Albert Museum, acquired as a model for its students (see also S.Ex.24-1884 and S.Ex.4-1889). They all share the characteristic of presenting a single plant rather than a bouquet, depicted without a vase or table, on a plain background. In these three pictures, the artist focused his attention on the contrast between the brilliant colours of the flowers and the plain neutral background pervading this the picture with a strong luminosity. 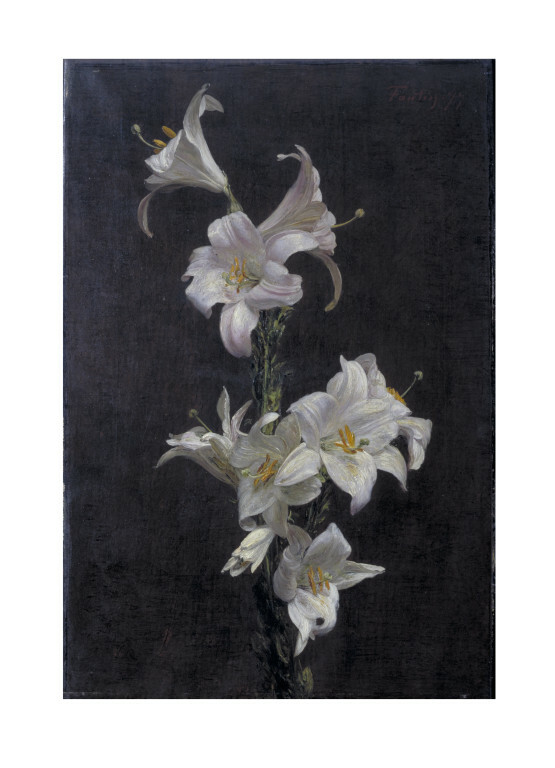 Whereas the other two paintings present a luminous background and intense colours, here the light effect came from the contrast between the pure white of the lilies and the plain background bathed in the shade, making this painting an obvious studio piece. The Barbizon School and the Impressionists engendered a new interest for naturalism and the objective rendering of light and colours. However, Fantin-Latour did not share their enthusiasm for open air painting and most of his compositions were executed in his studio. This painting was purchased from Mrs Elizabeth Ruth Edwards, who was acquainted with Fantin-Latour as she and her husband hosted the artist for a few months in their house at Sunbury-on-Thames in 1861. On this occasion, Fantin-Latour executed her portrait, now in the Musée du Petit-Palais, Paris. Mr and Mrs Edwards became his dealers in England and their friendship with the painter is witnessed by his portrait of them dated 1875, now in the Tate Gallery, London (F.738). 19th-century French art is marked by a succession of movements based on a more or less close relationship with nature. At the beginning of the century, Romantic artists were fascinated by nature they interpreted as a mirror of the mind. They investigated human nature and personality, the folk culture, the national and ethnic origins, the medieval era, the exotic, the remote, the mysterious and the occult. This movement was heralded in France by such painter as Eugène Delacroix (1798-1863). In its opposition to academic art and its demand for a modern style Realism continued the aims of the Romantics. They assumed that reality could be perceived without distortion or idealization, and sought after a mean to combine the perception of the individual with objectivity. This reaction in French painting against the Grand Manner is well represented by Gustave Courbet (1819-1877) who wrote a 'Manifesto of Realism', entitled Le Réalisme published in Paris in 1855. These ideas were challenged by the group of the Barbizon painters, who formed a recognizable school from the early 1830s to the 1870s and developed a free, broad and rough technique. They were mainly concerned by landscape painting and the rendering of light. The works of Narcisse Virgile Diaz de la Peña (1807-1876), Jules Dupré (1811-1889), Théodore Rousseau (1812-1867), Constant Troyon (1810-1865) and Jean-François Millet (1814-1875) anticipate somehow the plein-air landscapes of the Impressionists. Kauffmann, C.M., Catalogue of Foreign Paintings, II. 1800-1900, London: Victoria and Albert Museum, 1973, pp. 37-38, cat. no. 82. V. Dubourg Fantin-Latour, Catalogue de l'oeuvre complet (1849-1904) de Frantin-Latour, Paris, 1911, no. 843, p.91. Fantin-Latour, flower paintings : June-July 1962, London: 1962, p. 91. Emma House and David Ingram, Painting Flowers. Fantin-Latour & the Impressionists The Bowes Museum, 2011. ISBN: 978-0-9548182-5-8. The flower still-lives of French painter Fantin-Latour were popular with collectors in England and America. From 1862, his work was exhibited at the Royal Academy in London. The paintings displayed here are from a rare group of works by the artist in which a single plant is shown without a vase, against a plain background.